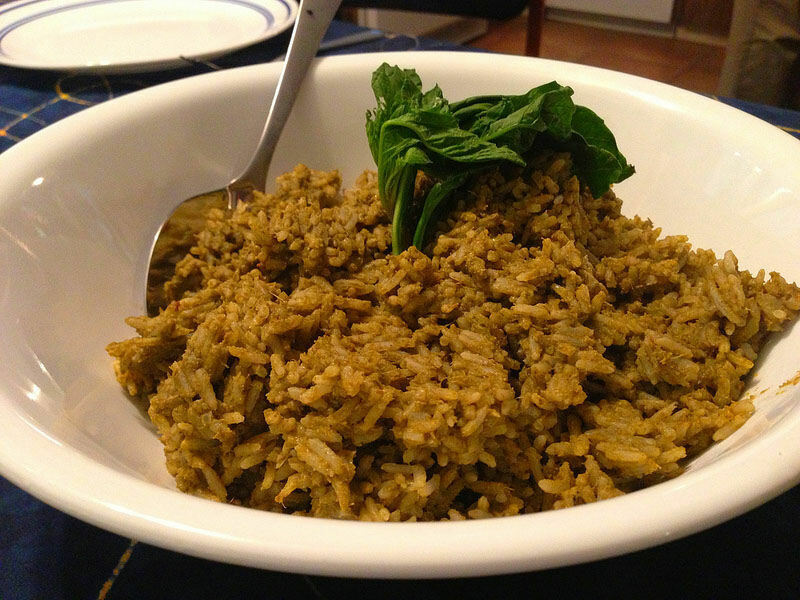 I finally tried the search string “Mexican green rice.” This produced recipes closer to what I thought I was looking for, but my mind was stuck on “Mole Verde.” Most of the green rice recipes were simple and did not have several of the ingredients included in the Mole Verde recipes I had looked at. 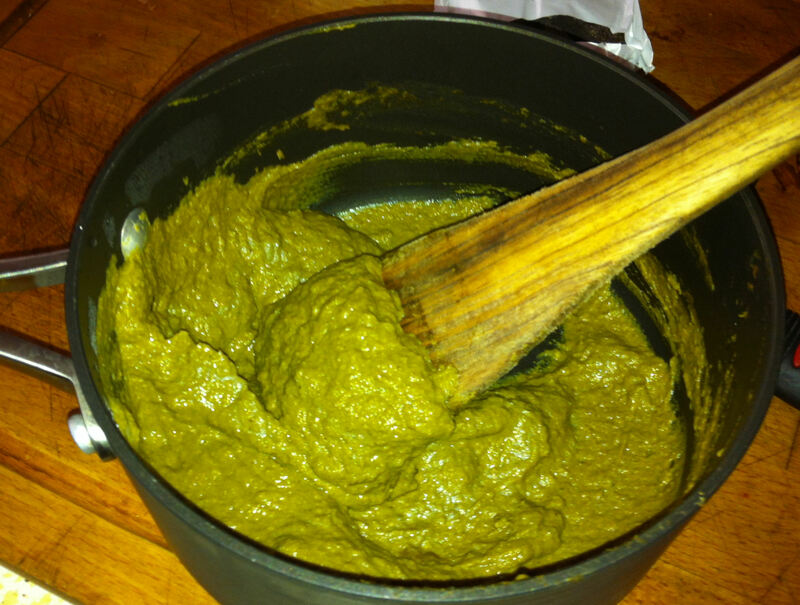 Many of the green rice recipes were simply mix a bottle of Salsa Verde with rice. What was the difference between Mole Verde and Salsa Verde? Many of the recipes seem to have the same ingredients but they had different names. I finally found my answer on a Mexican food blog De La Tierra. Moles are more processed and then everything is cooked down to a very thick sauce and salsas are thinner and may have cooked or raw ingredients. Mole Verde recipes have one thing in common, they are green. What makes them green depends on the recipe. There is always some kind of green chili (Poblano, Anaheim, Serrano, Jalapeño or a combination of these chilies) and some other green vegetable. The vegetable may be tomatillos, nopales, cilantro, epazote, spinach, lettuce, parsley, green onions or any combination of these. After these basics, the rest of the additions seem to depend entirely on the individual cook or region of origin. It was time to strike out on my own. One of the secrets I have learned about making Mexican Rice is to steam the rice separately and to mix it into the sauce at the last minute. That should work just as well for a green mole as a red sauce. My goal here was to make a thick Mole Verde and then to mix chicken broth steamed rice into it at the last minute. Tip: This recipe makes about 1½ cups of green mole. Save ¾ of a cup for a second meal (it freezes well). You can use it all, but it will make the rice a bit sticky. Let the rice cool slightly and fluff it to overcome this. 1. In a dry small pot toast the pepita until fragrant, 1-2 minutes. Remove them to a bowl. 2. Add the oil to the pot and sauté the chilies and garlic for one minute. 3. Add the tomatillos, cilantro, onions, and epazote. Cook on medium heat until the tomatillos are very soft (about 10 minutes). 4. Remove pot from the heat and add the pepper, salt and ½ cup chicken broth and let the mixture cool. 5. Put the toasted pepita in a blender, and grind the seeds into a meal. 6. Add one cup of the tomatillo mix to the blender and blend until smooth. 7. Adding the rest of the mixture to the blender and process until smooth. 8. Return the mixture to the skillet and simmer for 30 minutes. You want the mole thick, but not too thick, add more chicken broth if necessary. 10. Just before serving, mix the rice into ¾ cup of the mole. 11. Remove to a serving bowl and serve garnished with a sprig of epazote.